In a move that could dramatically reduce the commute times for Chelsea 111 bus riders, the City of Boston announced they are planning on installing a dedicated bus lane on North Washington Street from Causeway to Haymarket – a key clogging point for riders heading into Haymarket from Chelsea. It would be a move that would accommodate the 111 bus routes and two Charlestown bus routes, and Boston officials said the new lane could reduce travel times by as much as 25 percent. BTD Director Gina Fiandaca said they have been working closely with Boston Mayor Martin Walsh and the MBTA on the North Washington Street bus lane, and hope that they can get it done as early in 2019 as possible. She said that stretch of the bus route is often the most congested, and riders often find themselves waiting longer on the bus for the last leg than it would take them to walk. In order to accomplish the new lane, the City will have to remove some metered parking spaces and a commercial parking space, but a large chunk of the stretch is a large bus stop and ‘no parking’ zones. Gupta said they have no clear data yet on the time it could save commuters going inbound – though they will begin keeping that data very soon. However, in Roslindale where they installed a bus lane last year, commutes were shortened by 25 percent. The same data also presented itself in Everett two years ago when they put a dedicated bus lane on Broadway Everett. The announcement was one of several made by Boston Mayor Walsh at the Greater Boston Municipal Research Bureau meeting on March 7. The North Washington Street bus lane would be the first one in effect 24 hours a day in Boston. Supt. Mary Bourque said that for the first time in decades, more students are leaving the Chelsea Public Schools (CPS) than are coming in – an exodus of students that seems to be heading mostly to Lynn. According to CPS data, from July 1, 2019 through February 14 – 257 Chelsea students left for other communities in Massachusetts. Of the 257, the largest pattern saw 29 going to Boston; 35 going to Everett; 44 going to Lynn; and 34 going to Revere. Those are places that, historically, Bourque said usually leak more students to Chelsea than Chelsea loses to them. That trend has changed now. The root cause could come for multiple reasons, but Bourque said she firmly believes it all comes down to the drastic rise in rents and housing costs in Chelsea. Bourque, who has studied student mobility in depth during her career, said many studies have indicated over the years that student population is a bellwether for the changes that are coming to a community. In Chelsea, she said she believes this latest trend in student population could be sounding an alarm for the community to try to take action. “This is definitely something we have to pay attention to,” she said. “The demographics in our schools are telling of what is coming to the community at-large. We’re the canary in the coal mine for community shift. I see it as a positive though because we can look at it and get out in front so we can be prepared to meet the needs of that shift. A consequence of that loss is that the CPS budget is likely going to shrink due to the smaller enrollments. Bourque said the situation reminds her of what Somerville Public Schools went through some years ago as it gentrified on the back of Cambridge’s successes. At one point, she said she recalled they had somewhere around 6,000 students enrolled in the public schools, but as that City changed, the numbers dwindled down to around 4,000. She said Chelsea should fight to keep that from happening here. Chelsea has always had a reputation and a practice of having open arms to refugees and new immigrant populations. Now, as new immigrant families seem to be migrating a bit towards the North Shore, Supt. Mary Bourque said they are keeping an eye on Brazil and Venezuela as potential sources of incoming students. Bourque said immigrant groups from crisis areas of the world typically begin showing up in Chelsea schools about 10 to 15 months after the crisis in their countries. With the recent political upheaval in Venezuela with its leadership, she said the federal government is considering giving Temporary Protected Status (TPS) to Venezuelans. That, she said, could result in more students arriving from that country soon. In Brazil, she said a down economy has already brought a trickling of new Brazilian students to the district. State Rep. Dan Ryan said this week he is pleased in what is considered a step up in becoming the vice chair of the Post Audit Oversight Committee – a powerful committee that runs investigations of government operations and actually has subpoena powers. Ryan said Post-Audit Oversight certainly isn’t a household name for most people in the Town, but said it has a unique mission and is a sought-after committee on Beacon Hill. One of the most visible investigations conducted by the Committee came several years ago in the previous administration when the Department of Children and Families (DCF) came under fire for its handling and management of numerous cases involving children. Ryan has also been assigned as a member of the Mental Health, Substance Abuse and Recovery Committee, and as a member of the Transportation Committee. •Just across the North Washington Street Bridge, State Rep. Aaron Michlewitz came away with one of the biggest scores for the Boston delegation in getting assigned as chair of the powerful Ways & Means Committee. Rep. Ryan said that having such an important chair nearby will be very good for Charlestown as well as the North End. That will particularly be apparent with projects like the North Washington Street Bridge, which affects the North End as much as Charlestown. Michlewitz told the Patriot-Bridge that he is humbled by the appointment, and that while he has to build consensus across the state, he will keep his district and Boston in the forefront. For the first time, Chelsea, Revere and Winthrop are combining forces to conduct a comprehensive regional Community Health Needs Assessment (CHNA) and design a Community Health Implementation Plan (CHIP). Major hospitals, along with health centers, human services providers and non-profits that serve area residents, are working with municipal leaders, health departments and the boards of health of each community to develop the plan. Residents of the three communities are being urged to go online and fill out a survey that asks about local health issues and other aspects of community life. The effort is being co-coordinated by the North Suffolk Public Health Collaborative and the Mass General Hospital Center for Community Health Improvement (CCHI) with the ultimate goal of identifying, prioritizing and addressing the most urgent health needs faced by each community and the region. Such assessments are often used to apply for targeted funding to help address community needs. The collaborators have set an ambitious timeline. The CHNA and CHIP will be completed by Sept. 30, 2019, and will result in a guide for a three-year community health improvement plan that all providers can use. The process includes intensive data collection–hundreds of resident surveys, interviews and focus groups as well as collecting data from other agencies such as the MA Department of Public Health and the US Census. A website has been created, www.northsuffolkassessment.org, to provide information to anyone who may be interested. People who live or work in Chelsea, Revere and Winthrop are encouraged to complete a survey. It is available in English, Spanish, Portuguese and Arabic, reflecting the languages most frequently spoken in the communities. City Manager Tom Ambrosino said this week he is preparing new City regulations that would govern the short-term rental market (known as AirBNB) in Chelsea. That comes after Gov. Charlie Baker and the State Legislature worked out a sudden compromise at the end of the year to a bill that had been stalled since the summer. That bill was signed into law and went into effect statewide on Jan. 1. While it governs the practice, it also leaves a lot of room for cities to come up with their own regulations and to tax such entities. Ambrosino said he hoped to have something to the Council in March. Both houses of the state legislature and Gov. Charlie Baker found a sudden compromise at the end of December in their two-year session to push through the stalled short-term rental bill – which Gov. Baker signed into law on Friday, Dec. 28. The bill has been a long time in the making and has been shepherded through the legislature for years by State Rep. Aaron Michlewitz of the North End, who was happy to see the compromise reached. Short-term rentals are not a major issue at the moment in Chelsea, but there are more than a few out there. More are expected due to the proximity of the city to the airport and the Encore Boston Harbor casino. One of the keys of the state law is that it will be obvious who operates them and where, something that is kind of a mystery now. The new law requires a statewide registry of operators, something the governor had opposed for some time until late in the year. It also levies a 5.7 percent state tax on all short-term rental units, and allows cities and towns to levy their own local taxes as well. In Boston, it is proposed to put an additional 6 percent on each short-term rental unit. The trade-off with the registry for the governor seems to be a provision that allows for anyone renting out a unit for 14 days or less to avoid the taxation portion of the law. It was uncertain, but it initially did appear that those units would have to participate in the statewide registry. Ambrosino said they would undoubtedly push to go for the maximum 6 percent local option taxes. 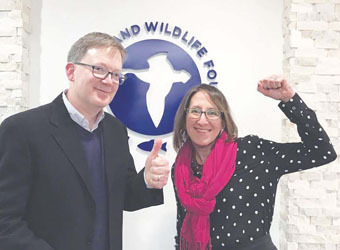 MyRWA Director Patrick Herron and GreenRoots Director Roseann Bongiovanni celebrating their successful argument in Washington, D.C., to return funds to the area. front of the North American Wetlands Conservation Act (NAWCA) Council to give Mystic communities a chance at $1.3 million in restoration funds. In January of 2006, approximately 15,200 gallons of petroleum product was spilled into the Lower Mystic River through an ExxonMobil Pipeline Co. terminal located in Everett. Accordingly, the US Department of Justice (DOJ) charged ExxonMobil with violating the Clean Water Act through negligence at the facility. ExxonMobil signed a plea agreement in 2009 that included a fine, the cost of cleanup, and a community service payment (CSP) that ultimately totaled $1 million to the Massachusetts Environmental Trust and $4.6 million to the North American Wetlands Conservation Act (NAWCA) fund. This plea agreement states that the funds should be used exclusively for qualified coastal wetland restoration projects in Massachusetts, with preference to projects within the Mystic River Watershed. During plea proceedings, the NAWCA Council and U.S. Fish and Wildlife staff assured the U.S. Attorney’s office and Judge Saris that a process would be put in place to ensure the CSP funds would be awarded in a manner consistent to the intent of the plea agreement. All funds managed by the Massachusetts Environmental Trust (MET) were immediately put to work on stewardship and water quality improvements in the Mystic River Watershed. In contrast, no NAWCA funds have come to the Mystic River Watershed. To date, $3 million of the ExxonMobil CSP given to NAWCA have been spent on other projects in the Commonwealth. The NAWCA Council was considering spending the remainder of the money ($1.36 million) on yet another project not in the Mystic. This would bring the amount spent on the Mystic to zero. Herron and Roseann Bongiovanni, executive director of GreenRoots, made the trip to Washington, D.C., on Dec. 12, to argue that money should be given to the Mystic. Prior to the meeting, David Barlow, Gene Benson and friends at GreenRoots and Conservation Law Foundation developed and submitted formal comment letters to the Council that outlined the history of these funds and the context for preference for the Mystic. “It was our communities and our waterbodies that were impacted by the spill on that cold January morning and now almost 10 years later, our communities are deserving of the penalty dollars to restore our ecological habitat and bring about environmental justice” said Bongiovanni. Fire Chief Len Albanese had his contract renewed for another three years by City Manager Tom Ambrosino. Albanese came to the City in 2016 from North Providence after a search committee chose several finalists, including some internal candidates. His contract was set to expire in June 2019, and Ambrosino said he is very pleased with the Chief’s work over the past two years. Albanese, a resident of Charlestown, will get a pay increase of 3 percent in the first year of his contract. In the following two year, upon a review by Ambrosino, he is entitled to up to 3 percent each year as well. The Chief will get 25 days of vacation per year, and can carry over five weeks of unused vacation time from one year to another. He may not, however, carry more than 10 week maximum of vacation time. He also gets 15 sick days per the contract, as well as an automobile. The new contract will begin on July 1, 2019. City Manager Tom Ambrosino said he would love to have a new contract and return to Chelsea so he can continue the work he started more than three years ago. The announcement came on the eve of the beginning of his annual evaluation by a committee of the City Council – a process that will start Aug. 27. Ambrosino is under contract for four years, and his contract runs out in July 2019, but the Council is required to notify him by January if they want him to return. Ambrosino signed his contract on July 20, 2015 in a four-year deal. Upon coming into the position, one of his first goals was to begin revamping the downtown business district, which was something that former City Manager Jay Ash had defined as a next focal point before he left. Ambrosino said he feels like he only just started that work, and while a lot of planning and groundwork is complete, he’d like to see things completed. He is particularly impressed with the collaboration between the community and stakeholders like MGH, North Suffolk, Roca, the Collaborative, GreenRoots and so many more. All of that comes right alongside the upcoming City Manager evaluation process. That has run a little slowly this time around. Though it is supposed to start in April, the Council appointed a committee but hasn’t had meetings yet. They will kick that off on Aug. 27, Council President Damali Vidot said. The Committee is made up of Councillors Vidot, Judith Garcia, Bob Bishop, Leo Robinson, and Calvin Brown. They will evaluate Ambrosino on at least 11 points of his performance over the last year. “It’s been tricky with our summer recess, but I’m confident we’ll have it wrapped up by October,” said Vidot. She said a sticking point for her in any upcoming contract talks with Ambrosino – and in his evaluation – will be his residency. Ambrosino said he cannot relocate to Chelsea due to personal circumstances that existed before he took the City Manager job. Vidot said she feels strongly that the City Manager should live in Chelsea, but she also said that the previous Council didn’t require him to live here, so it wouldn’t be right to enforce it now. “However, that shouldn’t be the norm moving forward,” she said. The Residence Inn by Marriott on Maple Street has petitioned the Zoning Board of Appeals (ZBA) to expand their 128-room hotel by another 68 rooms. The expansion would take place in the existing surface lot to the north of the hotel. The idea would be to create a 200-room dual branded hotel, which is a current direction in the lodging industry. The expansion would add 28,234 sq. ft. to the existing structure. The majority of the hotel is extended stay rooms now, but there would be 12 non-extended stay rooms created during the expansion, if approved. A special permit is required for parking because 118 spaces are required, and only 86 are provided. A Site Plan Review process is also required. The matter has been in front of the ZBA already for a preliminary hearing, and a vote on the the project is expected at this month’s meeting. 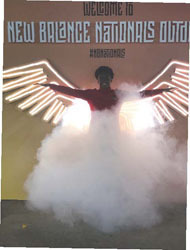 CHS Sophomore track star Stephanie Simon in a promotional photo from the New Balance High School National Championships last weekend at North Carolina A&T University.Simon was the first female athlete in CHS history to go to the nationals, and she competed in two events. She placed 15th out of 54 in the high jump. Simon, only a sophomore, has starred for the track team over the past year, along with her sister, Martine, who is a senior. Stephanie distanced herself from the pack in qualifying earlier this year to compete at the New Balance High School National Championships last weekend at North Carolina A&T University. In the high jump, the talented sophomore finished 15th out of 54 competitors from all over the United States. Meanwhile, in the triple jump, she placed 27th out of 44 competitors. Simon has already set several school records and placed high at the Division 1 State Meet earlier this year. She is also a very talented hurdler as well.